Welcome to "I PLEAD The Blood Of Jesus 3"
Over Everything and Everybody around you......Please Let Us Add YOUR NAME, CITY...HERE: and list what Your Are Claiming Jesus' Blood to Cover...In Your Life! 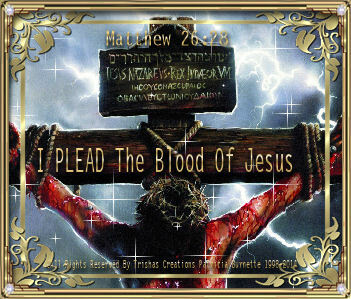 I PLEAD THE BLOOD OF JESUS !! !